Another one for the OnePlus Army! We're giving away 6000 complimentary tickets of Marvel Avengers: Infinity War, exclusively for OnePlus users! Set your alarms now as tickets will be out at 10am on April 26 See Marvel Studios’ Avengers: Infinity War in theaters April 27. MaalFreeKaa.in No. 1 Free Sample And Online Contest News update website. You can find here all update about Online Giveaway, Freebie Deal and Shopping News. Mostly IPL 2018 Season T20 Cricket India is Live Grab Free IPL 2018 Ticket, IPL T-shirt, Your Favorite IPL Team Merchandise, Official Jerseys and much more only get here because we are share all T20 IPL 2018 Contest. Also Catch or watch IPL 2018 Most Record, Catches, Wickets, Six and four. Live IPL Score Twenty20 cricket league in India contested during April and May of every year by teams representing Indian cities and some states. 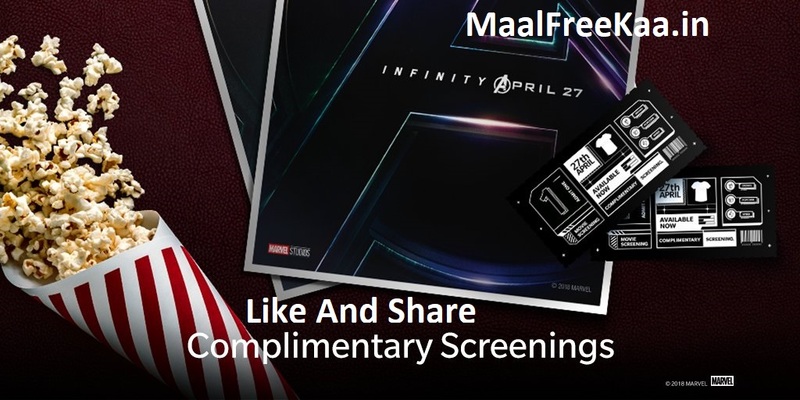 Treat yourself to some free Popcorn and Coke while you sit and watch Marvel Studios' Avengers: Infinity War. Enjoy the surreal experience of watching the Avengers with the OnePlus community. Let’s come together and defeat the forces of evil! You're invited! Marvel Studios' Avengers: Infinity War movie screening exclusively for OnePlus users. Step 1 : Register your OnePlus IMEI number. If you have registered your IMEI previously you can skip this step. Step 2 : Choose your city and confirm the movie time. 1. Tickets go on sale at 10 AM on 26th April. 2. Ticket voucher can be generated immediately on oneplus India. 3. Head over to the Paytm app and use this voucher to choose the movie in your city. 4. Please use the voucher by 16:00 hours on the same day. 5. 1 OnePlus account can get only 1 movie ticket along with snacks for ₹1. 6. Select the same city that was selected on the OnePlus website for generating the voucher. Your voucher will not work on Paytm if the cities selected on the OnePlus website and Paytm are different. 7. Kindly note if the promo code/voucher is not entered, the transaction will fail as the seat can only be booked through the ticket voucher that is given out. 8. Users don’t need to add Coke or popcorn in their orders as these will be given directly in the theatre. 9. You will receive a booking confirmation number. A confirmation email/SMS will be sent across to you. 10. In case you do not receive the email or SMS, please check for the order history on the website/App, or write to us at care@paytm.com for assistance. 11. Cashback will be processed within 24-48 hours of successful transaction. 12. Paytm solely reserves the right to change/modify or stop the Campaign at any time without any prior notice.